1) Eight was apparently enough. The Canucks snapped their 0-7-1 losing streak with their first win in more than two weeks. 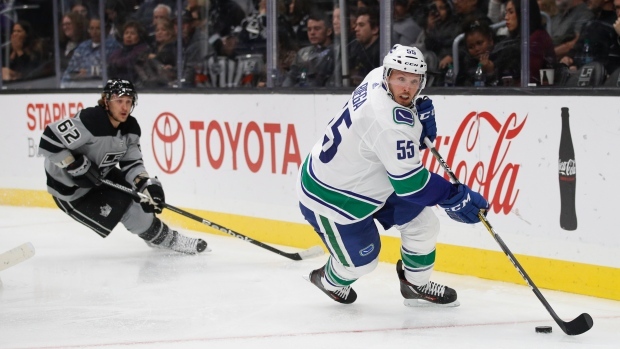 After a scrambled first period in which they took four penalties on Friday in San Jose, the Canucks played a tidy, low-event opening 20 minutes in Los Angeles which allowed them to find their footing. They dominated the second period outshooting the Kings 14-6 in the middle frame and likely felt they deserved to be ahead going to the third. Instead, they found themselves in a 2-2 tie after 40 minutes. But playing their third game in four nights with travel in between, the Canucks put together a solid third period scoring the only two goals propelling them to victory. Given the team's recent rut while short-handed, it seemed almost fitting that to secure the win, the Canucks had to kill a late Kings power play. It was like one final hurdle to clear and not only did they successfully kill the Alex Edler delay of game penalty with 2:52 to play, but Tyler Motte sealed the deal with a long-range short-handed empty net goal to extend the lead to 4-2. 2) Jake Virtanen had one of his best games of the season and perhaps one of the best of his young career. He logged 20:17 on the night -- three seconds shy of his season-high for ice time. It was all at even strength where he led all Canuck forwards on the night. He made a terrific feed to Adam Gaudette to open the scoring with his long-awaited first NHL goal. After some solid work by NIkolay Goldobin on the side boards to free the puck, Virtanen sold a slap shot from the left circle to freeze Kings netmidner Cal Peterson. He then deftly slipped the puck across the slot to Gaudette who made no mistake finding the back of the net. Virtanen's night began with a back and forth battle with Dion Phaneuf. After the game, Virtanen revealed the two were chatting during warm-up. They then each got the best of one another on first period collisions that seemed to get Virtanen into the hockey game. He finished the night with just one shot, but had five attempts. Somehow he was not given credit for any official hits on the game sheet, but he did have a pair of takeaways and a blocked shot. He skated miles and used his speed effectively to backoff Kings defenders creating space for his shot attempts and his set up to Gaudette. 3) The Canucks never trailed in the hockey game. That's a marked departure from a team that had led for just 92 seconds in the five games prior to Saturday. It was the first time since a game against the Islanders in Brooklyn that the Canucks opened the scoring. Although the Kings answered both Vancouver goals in the second period at 1-0 and 2-1 with goals of their own in relatively short order, the Canucks did not panic. Jacob Markstrom made the saves he was supposed to and didn't surrender any soft goals which had plagued him in recent starts. He got some help from his goalpost on a Jeff Carter shot eight minutes into the third period when the game was tied 2-2. Other than that, the Kings didn't mount much of a push and it was the Canucks that dictated how much of the game was played after the first period. Clearly there are better teams in the league than the Kings (30 of them according to the standings) so there will be plenty of tougher tests ahead, but on this night, the Canucks did what they had to do to end their slump. And they'll see the Kings again on Tuesday with a chance to start a winning streak. 4) Elias Pettersson continues to reveal new wrinkles to his game. On Saturday night, it was the anticipation that Dion Phaneuf was going to try a risky cross-ice breakout pass midway through the third period with the game tied 2-2. Pettersson casually stepped in front of the intended target Dustin Brown, picked the pass off and then strolled into the left face-off circle in the Kings zone. Two weeks ago in Detroit, he wound up with a big slap shot from that spot. This time, he was a little more refined picking his spot with the wrist shot and snapping the puck far side on Kings goalie Cal Peterson. It was Pettersson's only shot of the night, but he made the most of it putting his team in front for good. Earlier he started a terrific sequence on a second period power play moving the puck quickly down low to Bo Horvat who found Sam Gagner in front for the 2-1 goal. That was Pettersson's first assist since a helper in Boston in the team's last victory. While he wasn't dominant on Saturday, he found a way to score the winner and set up another and definitely left his mark on the hockey game. 5) All things considered, the Canucks survived the treacherous start to their season leaving Los Angeles with a record of 11-13-2. It's not as good as it appeared it might be when they were 10-6-1 through 17 games. But between injuries and all the travel they have done, they have managed to stay within sight of the pack in a sluggish Pacific Division. Saturday marked the end of a crazy stretch that saw them play 17 of their first 26 games on the road. To put that in perspective, the Kings and Ducks have played 18 road games combined. The Canucks get a couple of days to rest before they open the first of two five-game homestands between now and a five-day break for Christmas. They play 10 of their next 13 at Rogers Arena with one three-game trip to Columbus, St. Louis and Nashville in mid-December. Otherwise, they will get a steady dose of home cooking. They got Alex Edler back on Saturday and should get Jay Beagle back at some point in the next week to 10 days. Brock Boeser remains a question mark, but if he can get healthy and back in the line-up, then the Canucks have a chance to field a line-up that will somewhat resemble the one they started the season with.